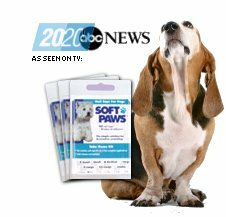 Soft Paws are extremely safe and non-toxic. Even if your dog swallows one, no harm will come. The nail cap will safely pass through the digestive system. STEP 1: Trim the nail tip. STEP 2: Fill nail caps 1/3 full with adhesive. Give the nail cap a gentle squeeze to distribute the glue evenly and release any air bubbles. If glue oozes out of the nail cap, you have inserted too much adhesive. Remove some of the glue by squeezing it out onto a paper towel. STEP 3: Slide nail caps onto nail. The nail cap should not touch the dog's nail cuticle. If it the cap is too large, trim the open end of the nail cap to create a better fit. STEP 4: Observe dog for 5 minutes before releasing. You can pet your dog or feed it a few of its favorite treats to distract.